Spacious Indoor Car Storage Facility, Highland: Are you looking for a spacious indoor car storage facility in Highland, CA? Look no further. Perhaps you are the proud owner of a classic car but your garage at home is becoming overrun with kid’s toys, tools, and other vehicles, and you’re worried that expensive and well-loved car is going to be damaged at your own home. Maybe you own a fine luxury vehicle, but you don’t have a garage to park it in during the winter months. Maybe you just need a place to keep an extra car where it won’t be in the way. Whatever the reason, when you find yourself in need of car storage, the options can be overwhelming. Do you want to keep it in an indoor facility, where it can be protected from elements or are you comfortable leaving it outside, so long as it is covered with a car cover? Do you need somewhere with spacious units and parking spaces so that you can bring your tools to do tune-ups, and to fix mechanical issues, or will you simply be parking it? 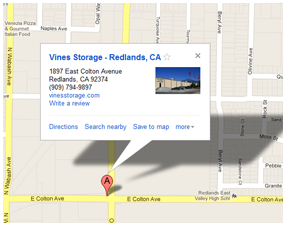 No matter what your unique needs, Vines Storage in Redlands, CA, has the solution for you. We specialize in finding the right storage answer for your car, recreational vehicle, boat, or valuable items. Storing a car indoors is typically the best solution. This keeps the car protected from rain, harsh sunlight, high increases or steep drops in temperature, and other outdoor elements such as dirt, dust, and debris. Keeping a car outside, even covered, can lead to chipped or faded paint, a dried out exterior, and dents caused by debris or hail. In addition to finding a facility that offers indoor storage, many classic or luxury owners place security at the top of their priority list. Keeping your investment parked in a secure facility and out-of-sight of neighbors or people driving through your neighborhood helps keep the car, and your home, from becoming a robbery target. Vines Storage facility is monitored 24 hours a day, seven days a week. In addition, Vines Storage offers flexible leasing options and the choice between climate-controlled stalls or self-park enclosed storage. Our goal is to provide our clients with the care, security, and convenience that they deserve. If you’re looking for a storage facility in the Redlands, CA, area, call us today to learn more.